Providing stunning visual evidence from their anthropological journey throughout Europe and the Middle East, including visits to Roslyn Chapel and Chartres Cathedral, authors Julie and Jerry Brown document the role of visionary plants in Christianity. They retrace the pioneering research of R. Gordon Wasson, the famous “sacred mushroom seeker,” on psychedelics in ancient Greece and India, and among the present-day reindeer herders of Siberia and the Mazatecs of Mexico. Challenging Wasson’s legacy, the authors reveal his secret relationship with the Vatican that led to Wasson’s refusal to pursue his hallucinogen theory into the hallowed halls of Christianity. 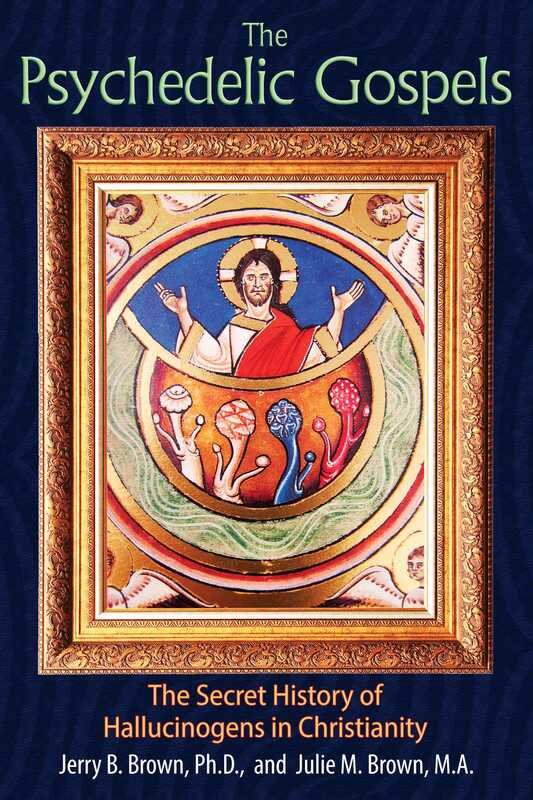 Examining the Bible and the Gnostic Gospels, the authors provide scriptural support to show that sacred mushrooms were the inspiration for Jesus’ revelation of the Kingdom of Heaven and that he was initiated into these mystical practices in Egypt during the Missing Years. They contend that the Trees of Knowledge and of Immortality in Eden were sacred mushrooms. The Church of St. Martin sat unpretentiously amidst a cluster of modest two-story stone homes with pitched roofs; their terracotta tiles glistened with the light rain. Stepping across the threshold was like having cataracts removed from your eyes and suddenly seeing in vibrant color and high-definition. Here the rich red, ochre, and white hues of the nativity scenes in the nave were a prelude to the panoply of powerful paintings that filled the choir in the adjoining room. “Look how big these mushrooms are, as big as the heads of the young men,” Julie noted. “Now step back and tell me exactly what you see,” I said. She spoke slowly, while rapidly clicking photos, as if she were rushing to capture these images before they could disappear, even though they had been here for nearly a thousand years. “Why do you think that’s Jesus?” I asked. “Isn’t the Last Supper supposed to be a Passover meal?” I asked. Julie grabbed her camera, zoomed in on the Last Supper, and then passed the camera to me, telling me to look closely at the robes of the disciples seated to the left of Jesus. To my surprise, neatly drawn into the folds of their hems were four umbrella-shaped psilocybin mushrooms caps whose stems were all linked together.